There isn’t much daylight between the two contenders for County Board this fall on affordable housing issues in Arlington, but the pair is offering different answers on one key matter: how much money the county should chip in to encourage affordable development. Independent incumbent John Vihstadt and Democratic challenger Matt de Ferranti have both stressed the importance of preserving affordable homes in Arlington as part of their respective campaigns, and both did so once more in responses to a questionnaire from the advocates at the Alliance for Housing Solutions, released yesterday (Wednesday). Both candidates also offered many of the same solutions for preserving affordable housing, like an increased reliance on housing conservation districts to protect older buildings. But their biggest divergence in answering the group’s questions came on whether the county should increase its annual contribution to its Affordable Housing Investment Fund. Commonly known as AHIF, the fund is a loan program aimed at encouraging developers to build affordable housing by offering low-interest loans for new construction or redevelopments. Though the fund also draws in some federal funding, tax revenue and developer contributions, the bulk of the cash comes courtesy of a county contribution set in each budget cycle. The Alliance for Housing Solutions asked each candidate whether the county should increase that annual contribution, particularly as rent prices continue to climb and the potential arrival of Amazon looms. For his part, de Ferranti offered a clear “yes” to that query, arguing that the county needs to strive to create substantially more “committed affordable” units per year, or homes with lower, more stable rent prices. “This will have the helpful byproduct of allowing us to better plan for new projects,” Vihstadt wrote. That difference aside, however, both candidates agreed that the Board should find new funding sources for the AHIF to ensure the program gets the money it needs to succeed. Vihstadt referenced the possibility of “increased dedicated recordation tax monies and even special purpose bonds” to send more cash to AHIF, or somehow taking advantage of the new “Opportunity Zone” designation created by the Republican tax reform bill last year, which is designed to lure investment to disadvantaged areas through tax breaks. De Ferranti also raised the possibility of setting aside “dedicated funding for AHIF through a specific revenue stream,” as the “community could more clearly understand the investment in affordable housing” if the county makes clear how it’s funding the AHIF. 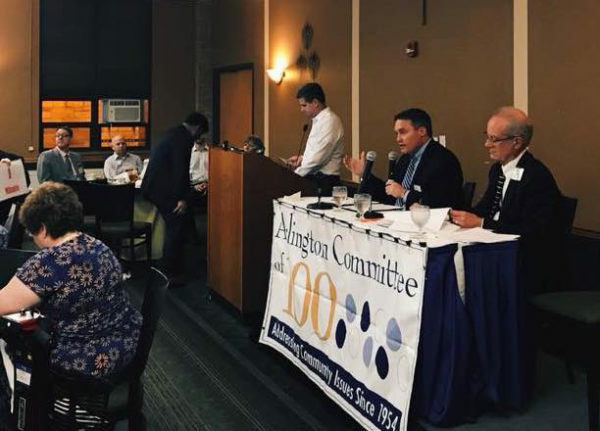 Like Vihstadt, he also proposed funding the AHIF with a bond as part of the county’s Capital Improvement Plan, which is normally set aside to guide funding for large construction projects around Arlington. “This would require considerable public engagement to achieve, but it is worth considering,” he wrote.